Maintenance work is set to begin this weekend to clear sediment and debris caught in the channels of Lake Thoreau. 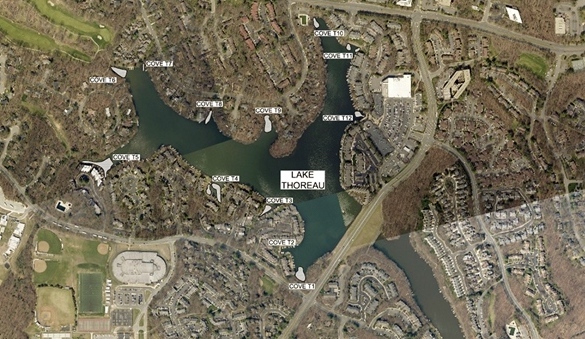 Reston Association is working with Lake Services, Inc. to dredge the lake beginning as early as Sunday (April 1). The work is estimated to be complete by the end of June. RA expects to remove about 848,290 liquid gallons or 4,200 cubic yards worth of material. Dredging helps maintain the depth of channels and reduces the exposure of fish, wildlife and people to contaminants, according to the National Ocean Service. Activity will not take place within five feet of any dock structure. The picnic area near South Lakes and Ridge Height Road will be serve as the staging area, according to RA. Sediment will be removed from the lake and placed in trucks. Disposal will occur at a site in Loudoun County. Access to the pathway near the picnic area may be limited.